You are ready to doze off and finally relax, but sometimes your plans can be ruined by one little detail: your pillow doesn’t really have that heavenly feel. Right, you pick the best, the comfiest down pillow and enjoy the blissful snooze every night. And I’m going to help you make a choice. Original Feather Pillow by Down & Feather Co. 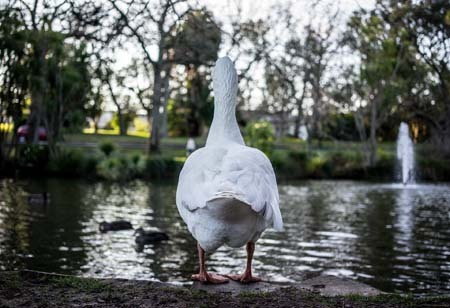 Duck vs Goose Down: Is There a Difference? Down vs Down Alternatives: Is There a Difference? Number one item on our list of the best down pillows is this model by Continental Bedding. It is cradling, natural, and breathable, which is a great combination for a good night’s sleep. Considering the superior materials this product is made from, it’s no wonder that it offers luxurious comfort. Actually, the luxury is not only inside the pillow but also on top of it. It is very pleasant and soft to the touch. The filling consists of 100% Hungarian White Goose down, which is super soft, warm, and cradling. The cover is made of pure cotton, which is pleasant to the touch and breathable. The pillow comes in Standard, Queen, and King sizes. What is really great with that pillow? The absolute best thing about this pillow is how generously filled it is. 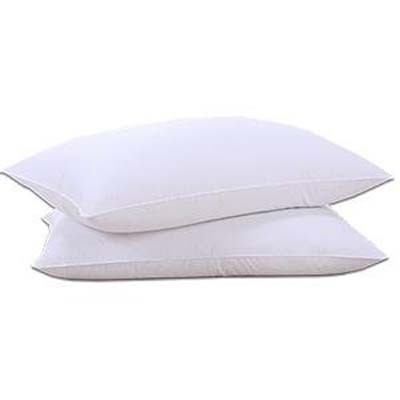 Down pillows tend to flatten up under the weight of your head since this material is very soft. However, this model is filled with enough down to support your head. What is wrong with that pillow? The worst thing I’ve noticed about this model is that it might feel a bit overstuffed for some users, especially those who prefer thinner pillows. It might seem too hard at first because of its thickness and will be perfect for side sleepers, while back and stomach sleepers might want this pillow to be flatter. To be honest, this pillow made me sleep all through the night. It is perfectly cradling and keeps the neck in a neutral position, which, I’m sure, you are going to enjoy. 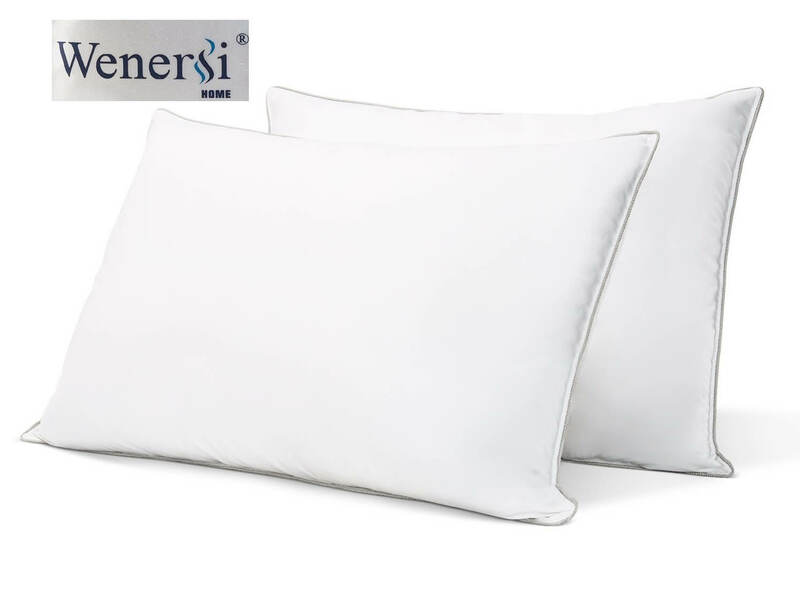 This model stands out among other best feather pillows thanks to its soft feel, fluffiness, and hypoallergenic properties. I’ve tried sleeping on it in all positions and found that the stomach one is the best, although back sleeping is quite comfortable too. But for people sleeping on their side, this will likely be way too flat. The filling is made of 100% White Goose down, which feels soft and doesn’t cause allergies. The cover is pure cotton, which is breathable and pleasant to the touch. The pillow comes in one Standard size. It is medium-stuffed and perfect for back and stomach sleepers. The absolute best thing about this pillow is its plush feel. It is very puffy and soft but doesn’t lose its shape under your head. It feels like sleeping on a cloud but has a moderate amount of loft to keep your head supported. The worst thing about this model is the fact that it might not be suitable for side sleepers. It’s just not tall enough to fill the space between your shoulder and head when lying on your side. I’ll admit: as a side sleeper, I couldn’t enjoy this pillow’s full potential. However, it made me feel super comfortable when I was lying on my back. And I’m sure you will also enjoy this top rated feather pillow. Another contestant for the right to be called the best feather pillow is this model by Wenersi. Thanks to the combination of feathers and down, it is a bit sturdier and more supportive than the majority of regular pillows. It’s pretty malleable and lightweight, so you can fluff it during the night if it happens to get a little bit flat under the weight of your head. The pillow’s filling is 85% of goose feather and 15% of White Goose down, which is supportive and soft at the same time. The cover is made of natural and breathable pure cotton. The pillow comes in two sizes – Queen and King. You can also choose between two different firmness levels, as there are both Firm and Soft models available. The best feature of this pillow is the combination of value and comfort. 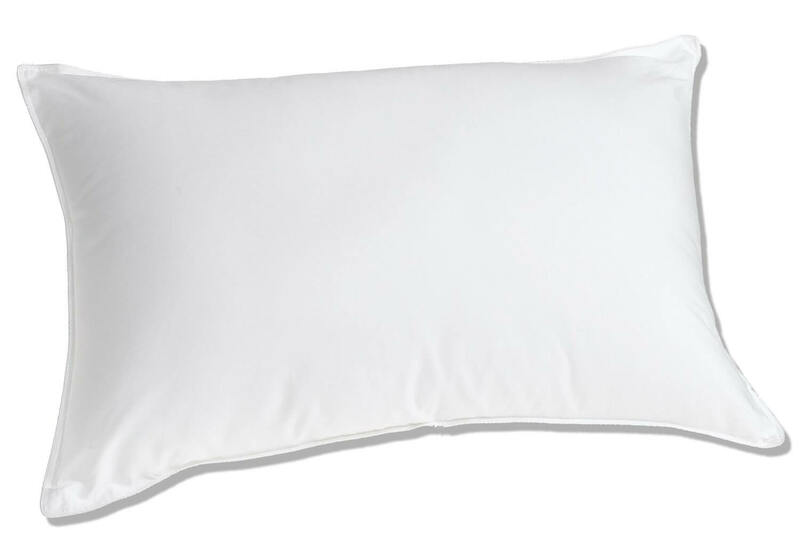 While being very reasonably priced (and it also comes in a pack of two), this pillow is supportive and cradling, which is great for all sleeping positions. The worst thing about this pillow is the fact that it tends to flatten up a bit during the night. This can be easily fixed by fluffing the pillow up. However, I realize that this might annoy some users. This pillow didn’t disappoint me. It is comfortable and supportive, which explains why this model belongs to the list of the top rated feather pillows. This is another model by Continental Bedding that deserves to be among the best down pillows. It is supportive and very pleasant to the touch. Being able to provide enough cradling and still feel soft, this is a perfect option for back sleepers. The filling is 100% goose down, which is contouring and warm. The cover is made of cotton, which is breathable and soft. The pillow comes in different sizes (Standard, Queen, and King) and in the sets of two. The coolest thing about this model is how supportive it is. When sleeping on it, I felt like my head was floating in the air. It was supported properly and the neck felt relaxed all through the night. It gets better: the pillow adjusts to the head shape but doesn’t lose its form and doesn’t turn into a flat pancake. The worst thing about this model is the fact that it’s not suitable for stomach sleepers. The amount of the filling is enough to support your head when sleeping on your back or side, but it might be way too much for stomach sleepers. Overall, this pillow made a good impression on me. It truly deserves to be among the top rated down pillows thanks to the comfort level it can provide. This pillow has all the right to be called the best down pillow. It is heavenly soft, squishy, and pleasant to the touch. It can make a good side sleeper pillow due to a firmer feel it offers. I mean, it does feel squishy but the firmness level is just right for sleeping on your side. The filling is made of the White Goose down. The cover is made of pure cotton. The pillow comes in two size options: Standard/Queen and King. This model belongs to the firmer category. The coolest thing about this pillow is how supportive it is. The amount of stuffing is very generous, the pillow is thick, and it is perfect for side sleepers. The material is soft and allows some sinkage but keeps its shape and doesn’t let the head drown in it. The worst thing I’ve noticed about this model is its firmness. While being perfect for side sleepers, it may be too firm for back and stomach sleepers. With this pillow, I didn’t experience any discomfort at all. It is bouncy and supportive, which is a great combination, especially for side sleepers like me. 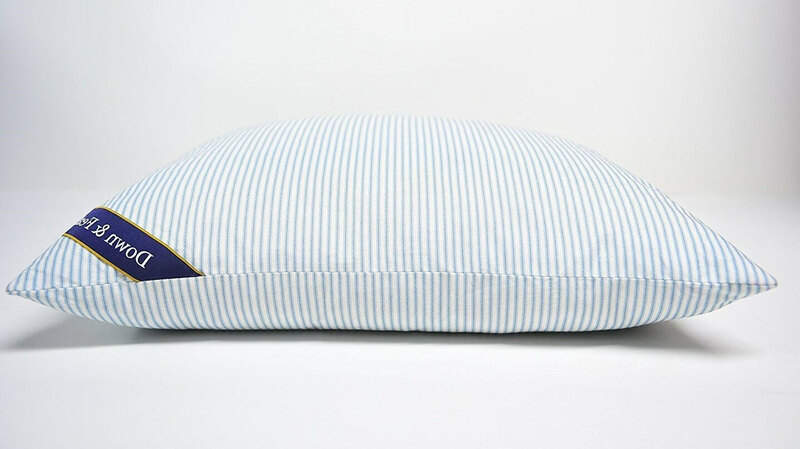 Another item that deserves to be among the best down pillows is this model by Down & Feather Co. It is fluffy and supportive enough to give you the best snooze every night. What makes it stand out from competitors are the satisfaction guarantees provided by the manufacturer throughout the first year of use, which allows you to ask for adjustments in order to make the pillow comfortable personally for you. Moreover, the pillow is covered by a 10-year warranty. 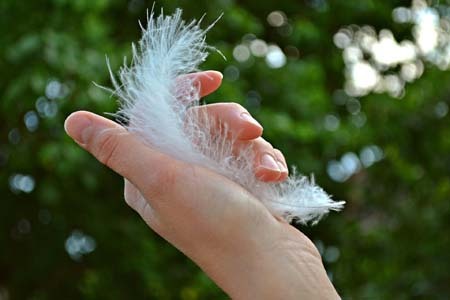 The filling is 100% Hungarian goose feather, which is bouncy and soft at the same time. The cover is made of 100% cotton, which is breathable and pleasant to the touch. The pillow comes with 3 different comfort options: Soft, Medium, and Firm. The manufacturer offers a 30-night comfort guarantee program, which implies adjusting the firmness level for free if you need. The coolest feature of this pillow is the fact that you can choose the thickness and the firmness level according to your needs. It gets better: if you’re not completely satisfied with the pillow (if it feels too flat or too thick), the manufacturer will adjust it to your preferences for free. The worst thing about this model is the cover. While being made of cotton, it is rather thin and allows occasional feathers to poke out. This can be fixed with a denser cover. Or you can use a couple of pillowcases. Still, this feature might annoy some users, so keep it in mind. I must tell: I absolutely love this pillow. I picked the Medium model, which is perfect for both back and side sleepers. It has everything to become the best feather pillow for you. This model by Homelike Moment has made it to this list due to the balanced feel it provides. Having a blend of feather and down inside, it is quite soft, like all down pillows, but at the same time more supportive. Because it is not pure down, it costs much less than an average down pillow but is still of decent quality! The pillow’s filling is 90% White Goose feather and 10% White Goose down. The cover is made from polyester, which is safe even for people with allergies, and is double-layered to keep feathers from sticking out through it. This model comes in two sizes: Standard/Queen and King. This is a firmer option. What I like the most about Homelike Moment is, honestly, the price. You can get a set of two pillows for under $60, which is really cheap for such a good product. If you and your partner have the same preferences, this is an option to go with. What I didn’t like, though, was the lack of versatility. You can go with just two sizes and only one firmness option. I guess this pillow would work great for side and back sleepers, but stomach sleepers will want a softer pillow than this one. When testing this pillow, I had a few really great nights. For my head’s weight and size, this pillow offered just the right amount support and cradling. 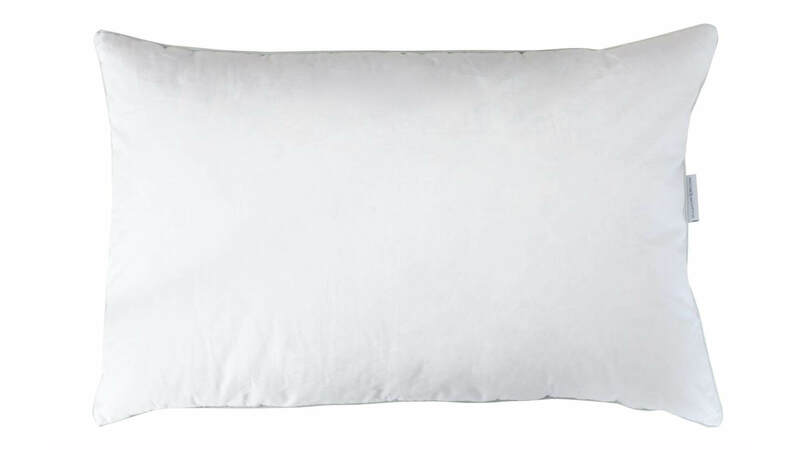 Chances are you will love sleeping on this pillow too unless you’re a stomach sleeper. Comfort. Pillows can be filled with goose or duck down/feather. But not only that defines their feel. The ratio between the components of the filling is important too. Also, the fill power should be factored in, as it defines durability and shape retention properties of a pillow. Cover. Some covers are hypoallergenic, others are not, which is crucial for allergy-prone people. Sometimes you can remove and wash the cover, and sometimes you can’t, which affects the ease of cleaning. Thread count is another important characteristic of the cover that defines whether the pointy ends of feathers will disturb you or not. Fluffiness. The fluffier the pillow is, the better air circulation it provides. Besides, fluffy pillows are cozier and it’s easier to shape them the way you feel most comfortable. Durability. Long warranties and even short satisfaction guarantees are rare for such products as down pillows. That’s why it’s important to evaluate the quality of materials by touch, as well as consider long-term customer reviews. When reading a product’s description, you will likely come across information about the filling. 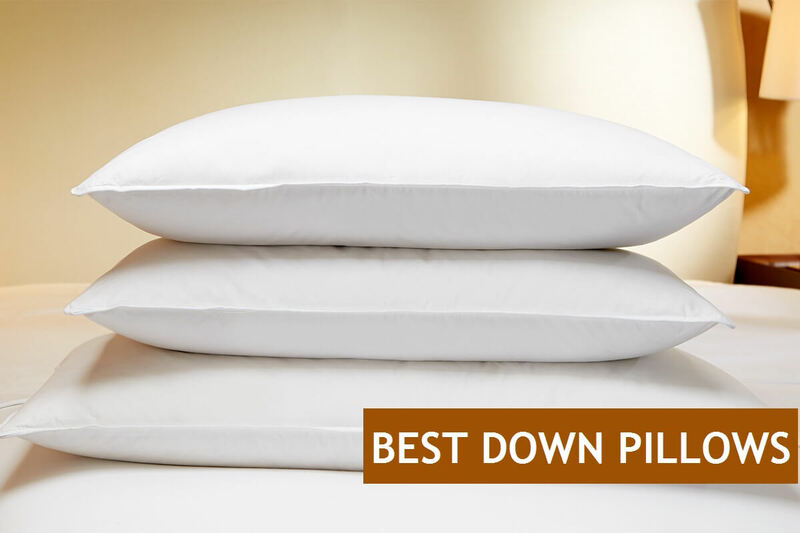 The most common materials for down pillows are goose down and duck down. They are typically combined to provide you the best qualities of each or can also be mixed with feathers. Duck down is a more affordable and less luxurious option. It usually has less fill power and smaller clusters of down. Also, it has a stronger potential odor. Goose down is a more expensive option. It is more durable and resilient compared to duck down. Also, it has better heat retention properties, which is good for cold winter nights. Typically, goose down pillows are of higher quality, but it’s not a rule of thumb. Some premium duck down pillows can offer you much more than average goose down ones. Down is considered to be quite an expensive material. And, as with all expensive things, one day a cheaper alternative appeared. Down alternative is either natural (cotton) or synthetic (rayon, polyester) fiber designed to offer a very similar feel to how true down feels. Pillows with this material not only feel but also look similar to down – that is, quite neat and luxurious. 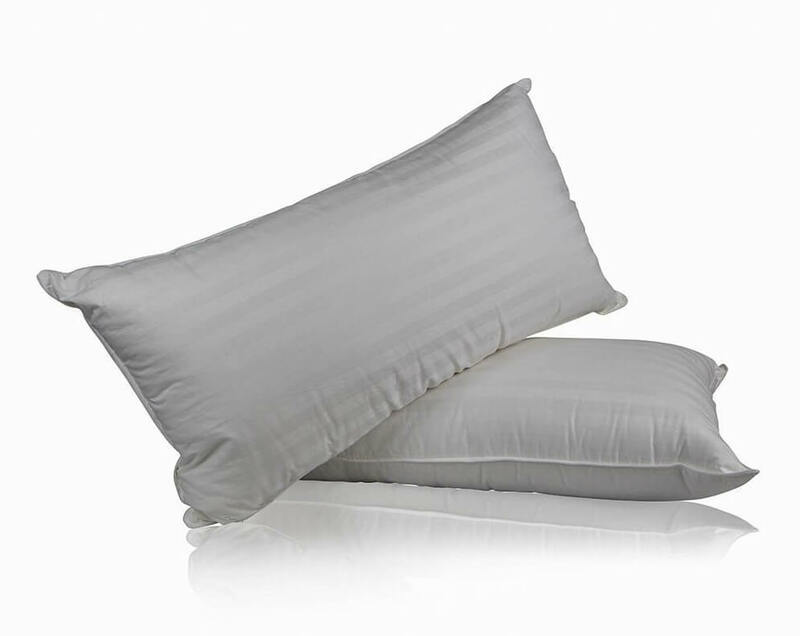 The best advantage that down alternative pillows can offer will be highly appreciated by allergy sufferers. This material doesn’t trigger allergic reactions! Besides, it is easier to clean and, again, cheaper. It can also be an option for people who are concerned about animal cruelty and the ethical question of using and wearing down. There are some downsides to down alternative too. They include lower durability, lower heat retention, and higher weight. Even the best down pillow might have certain drawbacks. So, before making a purchase, it’s important to consider both the good and the bad. They provide gentle cradling and decent support for your head and neck. They are moldable and can keep their shape. They are warm, which means added comfort during winter. Some feather pillows require constant fluffing up. They might be challenging to clean. They are warm, which means you might sleep hot during summer. Thickness. Side sleepers need their pillows to be taller than back or stomach sleepers. The level of thickness will always determine the firmness of the pillow, which can also influence your comfort. Cover. It should be breathable to help with the temperature regulation and thick enough to prevent the feathers from sticking out. Price. 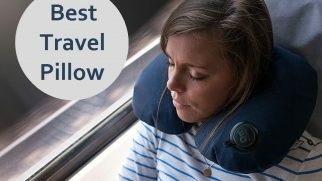 If you have a tight budget, going with a down pillow might not be the best choice since they are usually quite expensive. The average price for a feather pillow is around $80. Cheaper models don’t usually have enough filling. Firmer pillows help with snoring. 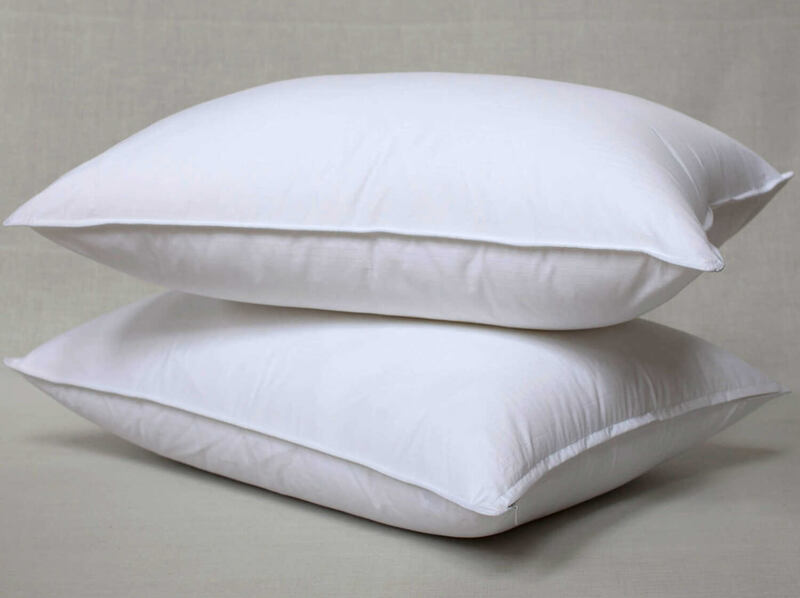 Down pillows don’t really make any noise, while feather ones might create a slight crinkling sound. They are great for pressure relief. They are susceptible to dust mites. I always imagined down pillows to be super soft and airy. And I didn’t believe such pillows could be comfortable. I, a sleeper who appreciates the proper support, thought that sleeping on a down pillow feels like sleeping without a pillow at all. However, these best down pillows made me change my mind. I realize now that they are super comfortable. And the best feather pillow among them is, in my opinion, the Original Feather Pillow by Down & Feather Co. It is responsive, supportive, and mildly cradling, which is a perfect mix for a good night’s sleep. Moreover, it comes with different firmness options, so you’ll definitely find the suitable model for yourself. Do you agree that down pillows are the comfiest ones? Are you ready to pay a bit more for this natural material and its superb softness? Tell us what you think in the comments below! Product links on Happysleepyhead are referral. We get a commission on purchases made through our links at no additional cost to you. More information in my disclosures. If I haven’t learned anything over the years it’s that pillows honestly make a HUGE difference when it comes to upper back and neck support. I actually keep a variety of pillows of various firmness and sizes for this reason so I can alternate between depending on what I need for comfort.